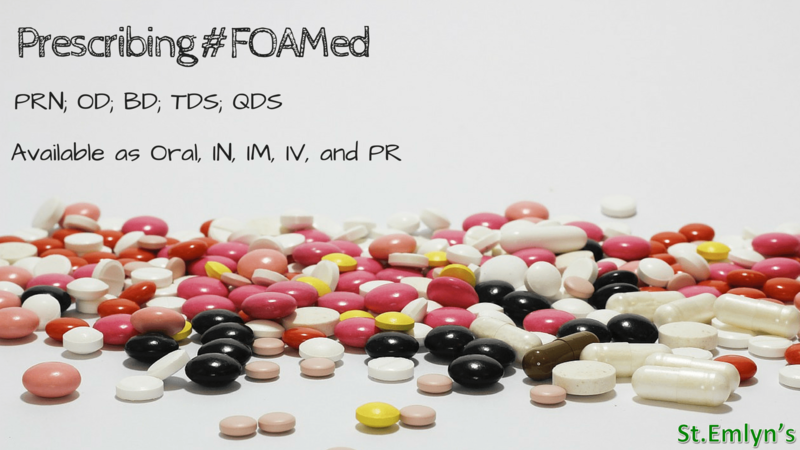 #FOAMed on prescription is something we have been doing for some time in the Virchester ED. It’s a way of cementing the sort of just in time learning that we excel at. For example we recently had a young chap come to the ED with a new onset SVT. Being young and fit he was not especially compromised and just needed a quick reversion back into sinus rhythm. As a reader of this blog you will of course be aware of the REVERT trial, published in the Lancet that clearly showed that a valsalva followed by a head down position is more effective than valsalva alone. Amongst the assembled doctors, nurses and paramedics it was clear that fewer than half of those present had seen or heard of REVERT (Ed – oh dear!) and so we had one of those impromtu teaching sessions that take place in EDs across the world. We prepped our patient and succesufully cardioverted him back into sinus. High fives all round, including our patient, and then off for tea and medals (well the next patient anyway). Now, I am under no illusion that a lot of the ‘teaching’ that I deliver in the ED does not result in ‘learning’. Partly that’s my technique, but largely it’s because we all tend to forget things very quickly. You may have come across the idea of spaced repetition for learning and I think we can deliver this using some #FOAMed based resources. So in this case we had a chat about REVERT, we did it and it worked, but what next? How do we try and embed that learning and facilitate a degree (well at least the start) of spaced repetition? Simple: Get your smartphone out and copy a link to the relevant #FOAMed resource into the body of the email. Then pass the phone round so colleagues can (only if they wish) enter their email. Press go and hey presto you’ve hopefully added a little cherry on the top of their learning experience. I’ve sent people blogs, podcasts, videos, all sorts really. You might ask why this is different from sending someone a paper or advice to read a text of some sort? I think it is as it’s about giving them something that is designed to be accessible on the device, and through the media that they will receive it on. If I’m sending someone a link to their computer, tablet or phone then ideally they should be able to one-click straight through to it, and it should work right there and then on the device that receives it. #FOAMed is designed to be consumed electronically and so the link is made (Ed – The media is the massage as Malcolm McLuhan said). I call this my #FOAMed prescription and I think it works. A couple of days later I’ll ask people if they followed the link and they usually do. They might not have, they might not have read the whole article but hey, if it just got them to think and reflect about the case when they saw the email later it’s probably still a small win. It also leaves a link on their computer that they may well be able to find again in the future, win, win. It’s only a small thing, but please, give it a go and let me know what you think. Great post – as you say, something we have been doing for some time. I think FOAM resources lend themselves well to workplace-based assessments too – if you undertake them properly (see my thoughts on this at http://www.the-emec.com/blog/natalie-may-top-of-the-dops-wpba-for-learning-and-teaching)! You can either set them as “pre-reading”, like a starting point prior to meeting (and critically appraise their implications together when you meet, or in a patient context) or as further reading resources after the WBPA has occurred (as long as you meet later to do the appraisal bit). As I often seem to sign people up to twitter (I should be on commission), I also use these resources as a tool for demonstrating how to use twitter – getting newly signed-up trainees to tweet a link to an “interesting” FOAM resource to provoke international discussion. This has worked nicely too and helps cement the value of the wider FOAM community on social media in the context of learning together. As you say, follow-up is the key to the success of this – something we might struggle with in time stretched departments – but I feel strongly it is time well invested, both for learning and for a wider sense of value among our trainees.